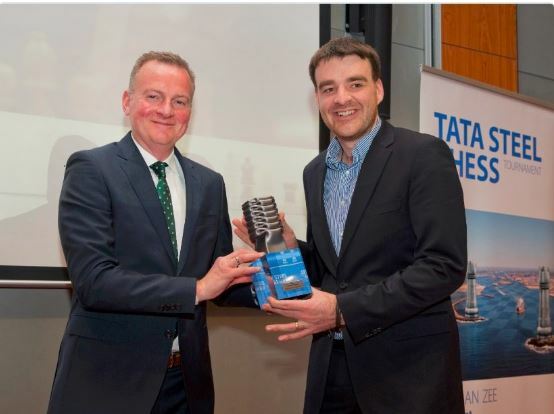 I’m so happy that Gawain won the Tata Steel Challengers (on tiebreak) with 9/13 along with Markus Ragger. The tie break in use was individual result which favoured Ga as he beat Markus in Round 6. Like most of you I was watching the last game and couldn’t bear to watch the proceedings (especially not in real life, I was in the press room) it was very tense but I tried to relax myself as I know worrying doesn’t help anyone. It was a very long tournament but Ga is very excited to be playing in the 80th Edition of the Masters next year. It’s rumoured to be very strong and Ga will be looking to follow Adhiban’s amazing debut against such a strong field. Looking at our already very busy calendar I’m sure this year will fly by and before we know it we will be back in Wijk! Ga’s score takes him up to 2677 and England’s No 2 for the first time and of course importantly heading towards that 2700 mark. Congratulations are also in order for GM Wesley So who won the Masters – his form has been impressive and I can see how important his support crew is to him. We also got a signed copy of the latest NIC!! The interview is very enlightening and I would recommend getting your hands on a copy. 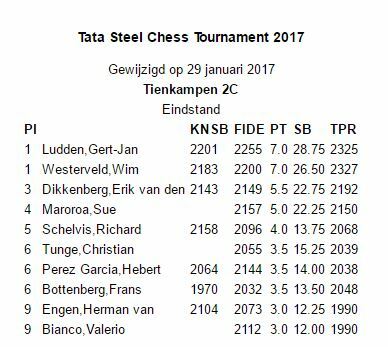 We would like to say a big thank you to Jeroen Van Der Berg, the main organiser of Tata Steel who organised a wonderful tournament. There were also many helpers, arbiters and staff around who all had their hand in running such a smooth tournament. 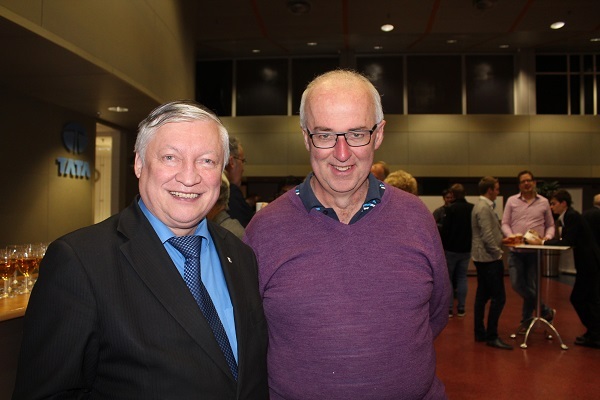 We were very lucky to have our good friends Bill & Maria from New Zealand come along, and especially that Maria spent some days in Wijk with all us chess players before escaping to the UK :-). They brought along some delicious Whittakers chocolate which I think gave Gawain the last push for the final rounds. I’d also like to thank our friends GM Nils Grandelius, GM Eric Hansen & GM Yasser Seriwan for keeping us company. When we arrived on that Thursday to such a cold and blustery evening I wasn’t sure what to expect and how our time would pan out in Wijk but I’m very happy with the way it did.We got into a very good routine with the earlier than normal start time of 1.30pm local time. I guess the perfect time is about 3pm – not too early and not too late. When I played in Ikaros the games started at 7pm (officially) and you would eat dinner about midnight! Here we ate breakfast about 10am, got the important coffee fixed then prepared until about 30 minutes before the round started. We skipped lunch and for the first few weeks I was fine but after Round 6 I caved in and got a ‘warme worst’ as a snack during the game. Of course we also had snacks during the games and most importantly for Ga, his coffee! After our game we headed to one of the 10 restaurants in Wijk. The quality of the food is very good but it did get a bit repetitive after nearly 3 weeks in this small town. Tarantella (the Italian) & Het Strandhuis (the restaurant at the beach) became our two firm favourites. Every meal for some reason would take until 9pm at which point we would head back to the hotel to unwind and in this case it was watching old episodes of Sherlock! We were lucky we were able to get BBC1 (South West – Maybe thanks to Mickey playing there in previous years) and so were able to watch the Final Problem which we enjoyed very much. Bill getting a “selfie” with Karpov! Thank you Alina L’ami for the photo! 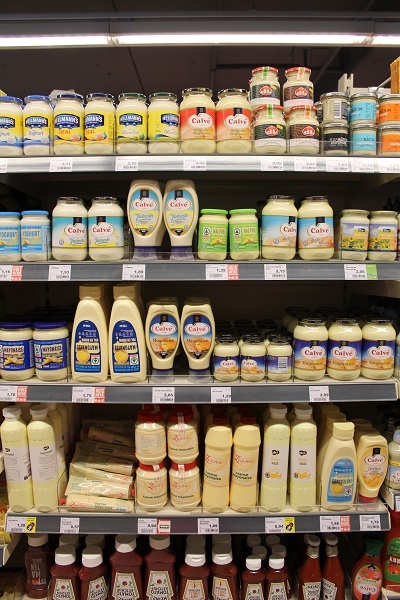 Dagvierkampen 2C. It’s not so easy to see my results on the main website but you can see it on my FIDE rating list. Before the tournament had started I wasn’t sure how it worked but I quickly found out. 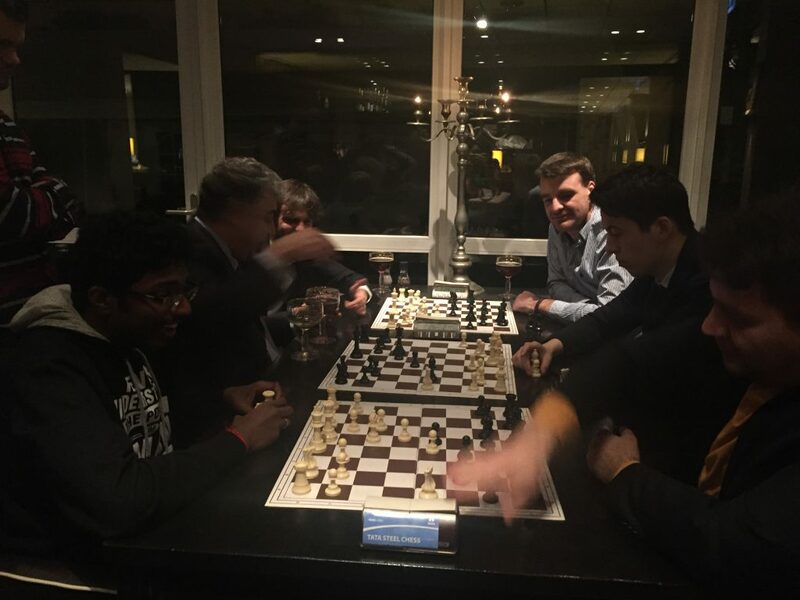 It was all very well organised: you each play in your own small group 1 game a day with the winner of the group getting some chess books as a prize. 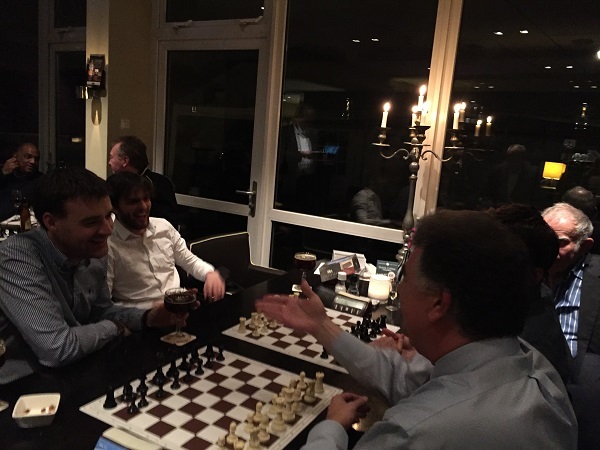 In the 3 round tournament I did rubbish – my play wasn’t so bad but I ended up on 0.5/3(!) and losing 30 rating points. 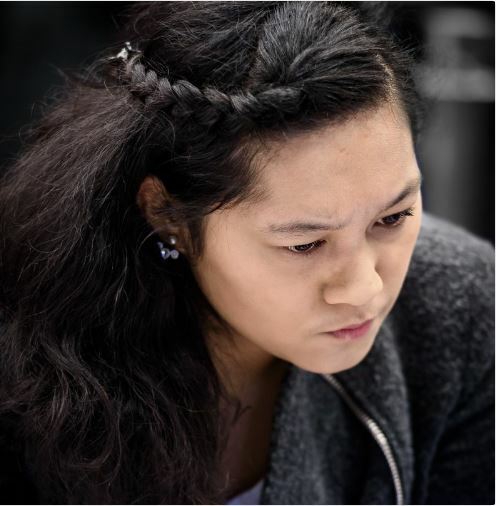 At that point I wasn’t sure if I was going to play in the 9 round tournament but Ga, Nils and Eric convinced me to and I’m glad I did – there would have been so other things for me to do in Wijk but playing was a good distraction. In that 9 round tournament in the first game I lost and that took my rating to -40! But in the 2nd round I beat the top seed Gert-Jan Ludden 2255. After that some things went wrong and some things went right and I even managed to gain from my second tournament. Unfortunately I lost overall so this sees me headed back down towards 2100 instead of up but on the bright side I learnt quite a bit and I’ll have 3 very strong tournaments to play in March/April. After the closing ceremony where we had the pea soup and I spoke a few (very little) mandarin to GM elect Tingjie Lei (whose English is more or less fluent) we headed back to the hotel for more chess. I kind of could believe it, that these GMs after 13 long games wanted to “relax” and play bughouse. It was a very fun and relaxed atmosphere and a lot of banter happening between the teams as well as a lot of blame when one player caused their team the loss. It’s impressive how quickly your partner turns on you and complains about what you did. I played two games with GM Vidit Gujrathi but after he told me to use pawns to block my kingside and then proceeded not to give me any pawns I declined to play again. 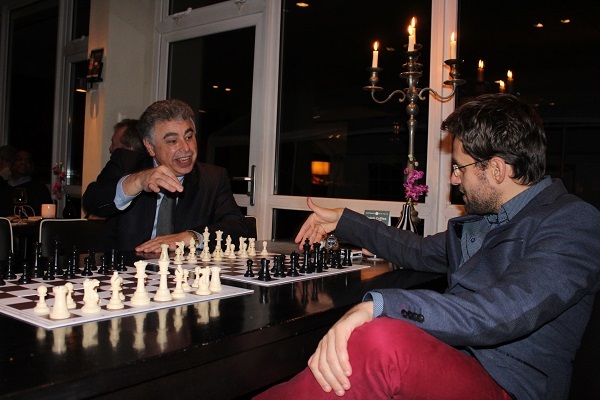 Lev explaining to Yasser some bughouse theory! At first Yasser and Lev started off badly which led to Lev complaining about his play being so slow and that he was so used to commentating as opposed to playing moves. Gawain and Nils were their first opponents and Nils is a former bughouse World Champion but after a few beers the quality of play deteriorated (not so bad that I could play). 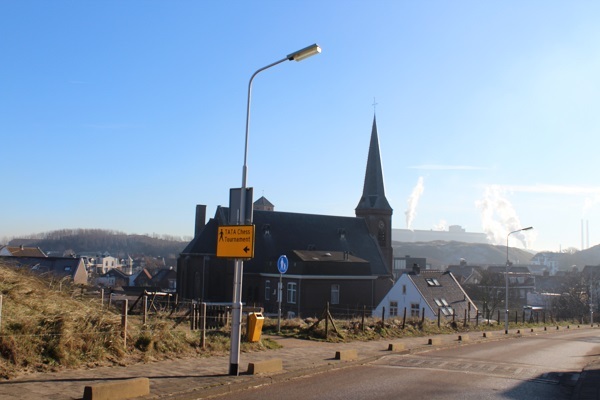 Would I recommend playing in Wijk Aan Zee? Yes, I would – being a chess player in this village is something special. I’ve never seen so much chess around (and I’ve played in 5 Olympiads!). I think it would definitely be a better experience if you are Dutch, especially with the live Dutch commentary, but I don’t think it takes too much away from your experience. There are many tournaments to play in and you are able to play in a round robin with other people with similar ratings. It’s kind of nice playing this way as you can watch your opponents’ games and get to know your small group. I would probably recommend coming with someone as company is always nice and, though the weather was pretty lovely while we were there, rumour is that it isn’t always that way. Also, if you are eating book ahead. We were turned away at several restaurants the first weekend. The chess front will be quiet for us for the next month and a bit other than some league games. We will be heading to Malaysia and Indonesia for some much deserved sun and holiday time.